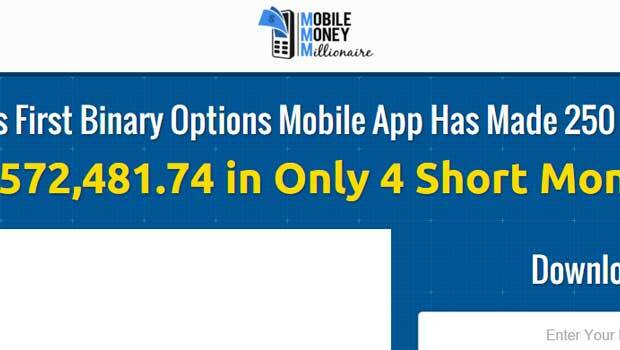 Mobile money millionaire is a new binary options application that’s made over $7 million for 250 users in the past 4 months. The developers of this system tell us that with our cell phones we are able to make $500-$2400 per day in pure profits. Today I’ll provide a review so that the binary today readers understand if this is a real investment opportunity or just an overblown marketing campaign. The mobile money millionaire website provides us with a short video, an email subscription form and a testimonial area. If you try to click on an image or anything on the webpage it will automatically pop up another email form to try and get you to enter the members area. In taking a look at the 6 testimonials on the webpage we can see the traders have been making on average over $30,000 in just a couple of months time. There is no way that I can verify these results because every time I try to click on one of the images I get a pop-up the tells me no credit card or PayPal is needed and that their app is 100% free. When we go into the members area will be forced to deposit funds with a binary options brokerage so a credit card will be required. According to the developers of the mobile money millionaire software we could be making anywhere from $15-$75,000 per month with binary options and it’s as easy as playing angry birds or candy crush. It’s obvious what the developers of the system are trying to do. They are trying to reach out to cell phone users and make it seem like their system is extremely profitable and equally as easy to use. I am skeptical and I’m really not sure that this system is going to be able to provide the results they claim they can because there are no results or trading statements that verify the claims. At this point in time I will not be able to recommend the mobile money millionaire system to the binary today readers. This really seems like another free-based binary options system and all these types of programs have failed in the past. With that type of bad track record I really don’t feel like we should get involved with any binary system that forces us to sign up with a broker in order to gain access. If you something you would like to add to this review please leave your comments or questions below the article now. Thanks for coming to binary today and I hope that this article helps develop a proper analysis for you.